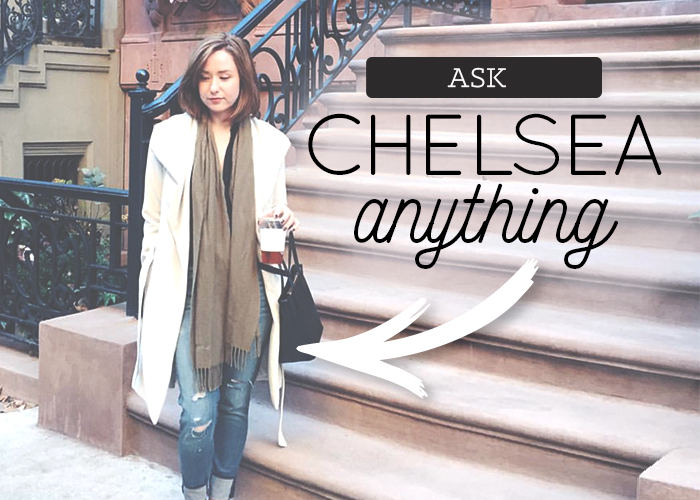 Hello and welcome back to a somewhat-delayed Ask Chelsea Anything! As most of you are probably aware, it’s been a chaotic June for TFD, between changing team members, West Coast travel, book-writing, VidCon, and some personal goings-on. This means that my favorite thing, and the reason why TFD exists in the first place — writing! — has sadly fallen by the wayside as everything else gets taken care of. But I am back, spiritually, mentally, and professionally, and that means jumping back into the Ask Chelsea Anything inbox (which has grown to an uncomfortably-large unread email count in my absence) and start answering questions again. This week, we’re talking to two very different women who have two very different dilemmas: One is wondering how much is appropriate to spend on tickets to see her faraway boyfriend, and the other is wondering how to navigate the often-terrifying world of employer-provided health care. Let’s get to it, and don’t forget to email askchelseaanything@thefinancialdiet.com with your questions! We are discussing travel plans for the rest of the summer, fall and winter, and I expressed my concerns over what’s practical and within budget. He agrees that is important, but he is wondering whether what he and I imagine to be “practical” is the same thing, mentioning that he has arranged his budget to work in his flights because making time to spend with me is a high priority. I think that I would be comfortable booking another trip to visit in August or September, but not both. Technically, I have the money to do both, but would prefer to save my shekels, so to speak. Two years is a long time, and I don’t want to blow through my savings in the first year. Am I being cheap and unreasonable, or level-headed and responsible? How do my boyfriend and I talk about this issue without getting into the dirty details of each other’s budgets, and him feeling like I am prioritizing other expenditures over plane tickets? Hey, Frugal! I think your problem is an interesting one, and certainly one that most people in a long-distance relationship experience at least at some point. (Plane tickets are expensive, dammit! And getting time off of work to travel is hard!) But I think you guys are in something of a unique position, in that you are at the level of closeness where a) staying together through a two-year separation and b) visiting each other very frequently through that time are on the agenda, but yet you aren’t close enough to share your finances or divulge your budget. Regardless of your preferences here, if you’re at the point where you’re spending a lot of money on one another to be in this relationship — and have very different views about what that amount should be — you’re better off being open about your budgets than you are figuring out how to not hurt someone’s feelings without doing that. Because the truth is that you probably are already hurting his feelings on some level, because all he can see from his POV is “hey, she doesn’t want to make as much effort/spend as much as I do on this relationship,” but doesn’t see the financial machinations going on behind them. So you should let him in a bit more so to speak, and if you want to find ways to set aside more money for these trips, having something like a side gig or occasional odd jobs that are explicitly to pay for these tickets could be one way to get there. That could even be something you commit to the other to do, if you wanted to get more on the same level in terms of spending. But none of those conversations, or productive solutions, can really happen until you can be a little more honest about where you stand, money-wise. You love him. You’re with him. You’re both making big sacrifices to keep one another in your lives for the next two years. Sharing an Excel sheet with each other is pretty tame in comparison. I’m an associate editor at a small, privately-owned publishing office with three monthly magazines. I don’t make tons of money (in the $25,000 to $30,000 bracket), but with budgeting and helpful info from places like TFD, I do okay. Except, that is, when it comes to health costs, because I don’t have health insurance. I was diagnosed with generalized anxiety disorder (GAD) about five years ago, and about one year ago when I graduated, my insurance coverage ended and I became unable to see my counselor. Since then, I have wanted to see a psychiatrist to find a medication that may help with my symptoms, but mental health costs are high, especially in Florida (ranked 49th overall in state spending on mental health per capita). As is common with people with anxiety, I think I may also be developing depression. To compound these problems, earlier this year I tested positive for HPV despite being vaccinated as a teen. Biopsies revealed I’m in the precancerous stage of cervical cancer–not yet cancer, but it will become cancer if left untreated. Most women’s bodies are able to correct themselves at this stage thanks to young, healthy immune systems, but with anxiety stomping all over mine (I’ve given myself shingles before during times of high anxiety), I’m worried my body can’t just fix itself. I’m due back for another biopsy next month, which costs about $450 to test, office visit not included. I’m concerned that the treatment, which requires anesthesia, will break my budget wiiiiide open. In the last few days, I have also noticed three suspicious moles on my stomach. I’m a pale person living in the Sunshine State, so the potential for skin cancer is high. I assume so is the price of biopsies, and, should I need them, surgeries to remove the moles. Since the company I work for is small, they don’t offer primary insurance, only group indemnity medical coverage. Most providers won’t accept this type of coverage without primary coverage, which I no longer have. As the TFD staff is probably all too aware, young people leave school with little to no knowledge of practical financial lessons, like choosing insurance plans. I was unfamiliar with the government healthcare deadlines and had no idea private companies were also subject to the same deadlines and criteria to enroll in coverage past those dates. Also, I was not knowledgeable about my own company’s lack of primary insurance offerings (though I was under the impression these benefits were available). During the application process, how can I ask interviewers about their company’s benefits without seeming like that’s all I’m interested in? I definitely care about being a good fit for the position and the position being a good fit for me, but I do need to know my medical needs will be met so I can be a productive employee. How can people like me, new to the world but hoping not to learn every lesson the hard way, educate ourselves on financial lessons? Most of the people in my life didn’t know enough to help me with this situation, and I’m not sure how I could’ve learned in advance. For this question, which feels way, way above my pay grade in terms of complication and nuance, I reached out to my friend Dani*, an HR professional who has helped me out in a sticky Ask Chelsea Anything before. But before I pass the torch to someone much more qualified than me to actually advise you on what to do, I want to share a bit about my own experience with not having health insurance: Long story short, I have it now, but for a long time — and very much because of my own idiocy/laziness/refusal to read fine print and meet deadlines — I didn’t have it as a young adult. (I also didn’t have it for a long part of my childhood because my father was freelance, and that made insurance for our family prohibitively expensive.) But either way, I know exactly how it feels to not have insurance, to feel that precarity and the fear that every minor problem is going to be the one that devastates you, financially as well as in terms of health. This is almost certainly compounding your anxiety symptoms (speaking as someone who also has GAD and made an entire video on the financial cycles that got me into), which only aggravate your health, and put you in a terrible pattern. If you’re already looking to change jobs, this is the right time to do it. You truly can’t afford, with your health problems, to be working at a job that doesn’t provide coverage for you (especially when it pays so low in terms of salary). Frankly, at this point, you’d be better off working at a Starbucks, which offers more comprehensive health packages than you currently have available to you, and would probably pay about the same annually. So, yes, you are right to look at that first and foremost, just as much as the salary (which a lot of young people never do when on the job-hunt). This means broadening your ideal jobs to include things that may be a little less glamorous than your current position, but are in more stable or profitable industries/companies that incentivize their employees in other ways, such as great medical and dental. You don’t want to “out” yourself in job interviews as someone who is going to be perpetually sick. But you can be honest and ask, once into the interview process, what the packages available to employees are. You can be honest and say that it’s a priority to you, and don’t need to explain it further than that. Health is a priority for many people, especially people who are older than millennials, so I’m sure any HR person worth their salt expects a question like that. Best of luck in your search! And lastly, to your second question, K, the truth is that it’s up to all of us to just read a ton. We should all have a few key sites/magazines/newspapers/Twitter feeds we check out every day that remind us of the things we should be thinking about in our own lives, and the world at large. Finding a good finance site, career site, health & wellness site, etc is going to be the difference between only realizing things are important when they happen to you, and acting in advance. No one is going to tell us exactly what we should be doing at all times, so at the very least, making it a point to read Generally Smart Adult Stuff at least a few minutes every day is one of our only lines of defense. (That, and making these kinds of issues a frequent and open topic among your social circles — chances are, if you and your friends talked a lot about money and work at brunch, someone might already have complained about their employer health care options, which may have kicked you into gear earlier.) So equip yourself well, and never be shy over talking about this stuff. Keeping quiet is only hurting you.